What can be cuter than receiving a gift in a jar? Not much, but making gifts in a jar comes pretty close. From preserving and canning recipes to salads and desserts, these mason jar recipes run the gamut and can be the hottest set of gifts you give out this year. Our readers say these recipes are not only great gifts for teachers, family members, holidays, and bridal and baby shower favors, they are great grab-and-go-meals, easy lunches to pack, and they're budget-friendly and fun to make. This collection of 11 Portable, Adorable Mason Jar Recipes will give you some great gift recipes and some easy packable lunch recipes for any time of year. You'll be surprised with how easy and affordable they are. 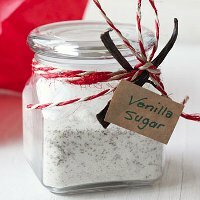 Cost of making one Vanilla Bean Sugar (see below for exact recipe) mason jar gift: $3.15! Give these recipes a try and let us know what you think in the comments below. They're sure to be crowd pleasers both for your recipients and your family budget. Enjoy! 1. 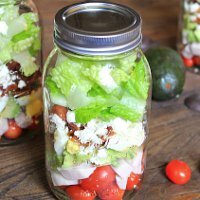 Cobb Salad in a Jar - (pictured above) This is the perfect gift or lunch. Not adding dressing makes this mason jar recipe last even longer. 2. Double Chocolate Chip Cookies in a Jar - Looks fantastic in the jar and in your cookie jar when made. A great idea for any time of year. 3. 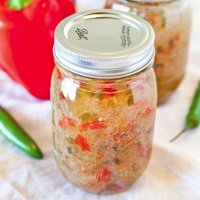 Hot Pepper Jelly Spread - (pictured above) This recipe is the hottest trend in canning. This is an entirely different jelly recipe. 4. 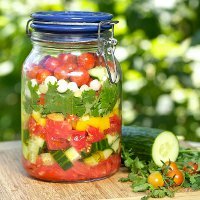 Garden Gazpacho - (pictured above) This a beautiful salad in a jar. It's definitely a summer favorite and so colorful for parties and gifts. 5. Homemade Apple Sauce - A slow cooker phenom. It's so cute and is a great Fall recipe to try and decorate for your friends and family. 6. Vanilla Bean Sugar - (pictured above) Great holiday recipe for your guests and for Christmas gift baskets. 7. Overnight Oats in a Jar - Perfect for busy families, this breakfast recipe cooks itself overnight and is waiting for you in the morning. 8. Homemade Dill Pickles & Spicy Jalapenos in a Jar - It's so easy you'll make them over and over again. Create the veggies you've always wanted. 9. Cozy Cappuccino Mix - An elegant and cozy treat for anyone this winter. This is a great subsitute for hot cocoa mix or coffee. 10. Sweet Cinnamon Pancake Mix - For a fantastic breakfast after any holiday celebration. Snuggle up at the kitchen table for this sweet breakfast recipe. 11. Pear and Ginger Jam - A classic treat for your holiday gift baskets. I cannot find the recipe for #10, the Sweet Cinnamon Pancake Mix for the mason jars. Any ideas?